We are watching the earliest stages of the dissolution of the Republican Party, and at this rate, it is quite likely that the G.O.P. will suffer the same fate as the Whigs did in the middle of the 1800's. I am not saying this because of the disaster that was the 2012 Presidential Election, nor am I saying this because of how the current political Right cannot seem to do anything to address the shifting demographics of this country. In and of themselves, this is damaging, but not truly fatal. In time, the Republicans could re-brand themselves to appeal to these groups. It has happened before, when the Democrats cut loose the segregationist ties that the Southern wing of the party had and whole-heartedly embraced the Civil Rights Movement. Remember, until President Kennedy met with Martin Luther King and convinced him that the Democratic Party would push for a complete end to segregation in this country, Reverend King was a Republican. Until the mid-sixties, most blacks in this country were a swing demographic at best. Now they are one of the most solidly Democratic groups in America. So in this sense, demographics are not necessarily destiny; all it would take is the Republican Party spearheading truly compassionate immigration reform, equal pay for women and a few other similar causes. If they did this, they might level the long term playing field, maybe not for 2016, but probably for 2020 and beyond. It only took about ten years to shift minority support into the solid Democratic column, and it is not a guarantee that it will always remain there. The reason that I am saying the Republican Party is doomed is because Charlie Crist became a Democrat. It is not specifically because he changed parties, while extremely popular in some areas of the electorate, his political shift is not what is going to bring down the Republicans. Instead, it is what the change symbolizes. Charlie Crist said the same thing Arlen Specter said a few years ago when he switched parties. He comments, "I didn't leave the Republican Party, the Republican Party left me." And it is that statement that shows the disintegration of the party. Understand, Charlie Crist IS a Republican, not a Democrat, at least not genuinely one in the post F.D.R. and Johnson Democratic Party. I am not condemning Crist with this statement; he is actually one of the Republicans I admire, along with Jon Hunstman. I think they are stellar examples of Republicans who are trying to work for a better America, and who passionately care about the future of this country. While I may find them to be a bit conservative for my tastes, I do recognize them as excellent leaders. But both of them are still slightly Right of center, whether you call them Progressive Republicans or Blue Dog Democrats. Their ideology is more on the right side of the traditional political spectrum than the left. Before I go any further with my overall point, I want to take a moment and discuss the political spectrum in the country. Despite what you hear from the talking heads on Fox News, the United States is actually a center-left country, at least in terms of what they want the government to provide. I am not saying this because I tend to be liberal and want to paint the country into my own frame of reference. I am saying this because the facts on the ground prove this orientation. When push comes to shove, Americans like the left at least slightly better than the right, even if they don't realize it or recognize that the things they like are on the liberal side of the spectrum. Some of the most popular things in America, the things that the majority of people by double digits say they like are to the left of center. Most people love Social Security, Medicare and disaster relief funds. Most Americans also strongly support Unemployment Insurance, Public Schools, the Interstate System, National Parks and Progressive Taxation. They even support things that they may not totally agree with like Welfare, Food Stamps and Medicaid. In general, over 60% of this country, including a fair number of Republicans, support at least the idea of a social safety net, and very few would like to see these programs cut back or eliminated. In the past, most of the debate centered not on the programs, but simply on the funding mechanisms for them. These are left of center ideals. They are not Socialist by any stretch of the imagination, but they do fall on the left side of the scale. Even our obsession with an enormous military force does not shift the scale that much, especially given our equal support of the V.A., the G.I. bill and military pensions. To further clarify the point, a center-right country might support some social safety net programs, but only in more extreme circumstances. It certainly would not accept the universality of these programs and benefits. You see the center-right approach on things like means testing of benefits, lifetime caps and other things to limit or eliminate access to them. Understand, I am not making a value judgment here, and this is a far cry from the "Makers/Takers" dialog that is occurring. I am simply talking about how a center-right country might approach these things. I also want to say here, for most of the 20th century, liberal and conservative were separate distinctions from political party; you had Progressive Republicans and Conservative Democrats. In fact, some of the greatest "liberal" achievements in this country were initiated by Republicans like Teddy Roosevelt and Robert La Follette. Also remember, Strom Thurmond was a Democrat until Lyndon Johnson signed the Civil Rights Act, which he tried to filibuster. For most of the 20th century, with the exception of the anomalies of the 1920's, and the Regan era, where the country to a decidedly right turn, the United States has been slightly liberal. And since the Bush years and the economic meltdown of 2007/2008, we have shifted back to our standard position of being a social democracy. However, the Right Wing of the Republican Party has not moved with the country; in fact, it has gone in the opposite direction. Today, even Ronald Regan, the ideological father of the modern conservative movement would be chucked out of the party for the simple fact that he raised taxes many times. At best, Regan would be called a moderate to his face and a R.I.N.O. behind his back. Eisenhower, who was probably the greatest Republican President since Teddy Roosevelt, couldn't even get nominated in today's party. Instead, that nomination would have gone to McCarthy. To return to my point, the reason the Republican Party is falling apart is that there is no room for the Specters or the Crists in today's party. The Far Right is purging them. To be fair, there have been extreme ideological impulses in the Republican Party before, Barry Goldwater being a perfect example, but even at the height of that movement, the moderates like Gerald Ford were not shoved out of the party. Ideological purity trumps electability, it trumps reality, and in the end, it trumps viability. 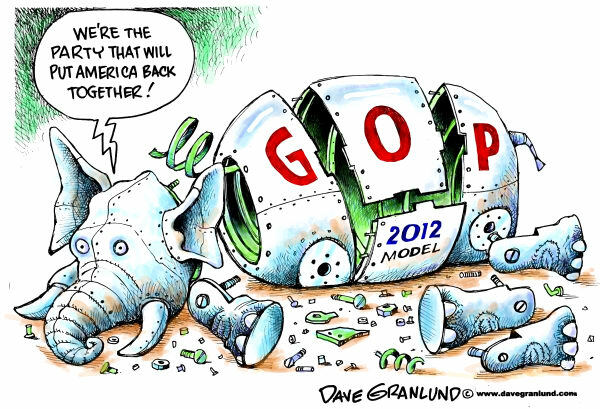 And if it continues, this is the end of the G.O.P. as a national party. Even though the Republicans currently have quite a bit of power in the States and in the House of Representatives, they are still killing themselves by pushing a hard Right agenda that will turn off the majority of voters eventually and accelerate driving the moderates out. But before Democrats crow about a perpetual majority, it also dramatically and irrevocably changes the face of the Democratic Party as well. Let me chart what might be the next twenty years of politics in this country unless the Republican Party reverses course and the moderates seize back the party. As more and more economically center-right and socially liberal Republicans are shoved out of the party, the party becomes more and more an echo chamber of Far Right Ideology. You see it even now with the calls to purify the conservative message. The party heads claim that they need to articulate the conservative vision better and people will flock to them in the next election. The problem with that is, the majority of the country is repelled by the call to turn Medicare into a Voucher Program, privatize Social Security and all of the other dismantling of the safety net that these people are advocating. However, purging the moderates removes what little reality check exists in the Republican Party, and so they move even farther and farther to the Right. And with it, they become more and more unappealing to the majority of people in the country, who as I said before, tend to be slightly center-left, and tend to like their government programs, at least the ones that they think they might need. In the short term, this means that the Democrats will continue to rack up huge wins, especially as the Republicans push an ever more extreme agenda. In this process, disaffected Republicans will become independents and then ultimately Democrats, but their core beliefs will still stay on the Republican side of the spectrum. It has been years since there has been a truly Progressive Republican; they fell victim to the Goldwater Purge of the 1960's. And as these former Republicans move into the Democratic Party, the party will shift somewhat to the Right to accommodate and welcome them. In fact, it will likely end up as a purely centrist party, sometimes falling slightly left, and sometimes slightly right. And during this period, there will likely be essentially one-party rule, with the Democrats becoming slightly schizophrenic trying to fill the role that was once held by two viable political parties. Also, as the Republicans purify, they will become a fringe party that is not much more viable than the Libertarian Party is today. Even if all of the Far Right parties were to merge, they still would not be viable in this center-left country. This is not a sustainable situation, and at this point, something interesting is likely to happen; the Democrats will become the conservative party. As the Republicans become increasingly bizarre, the Democrats will have to function as both a liberal and conservative party. Since the Democrats value their current image as the "Big Tent" Party, they won't throw the conservatives back out of the party, they will accommodate them, and in doing so, they will alienate the actual liberals of the Kennedy/McGovern wing of the party. Then, those disaffected Liberals will also succeed from their party, but since there is no viable party on the left, they will probably form their own party, splitting the Democrats in half. For a couple of election cycles, they will not win, any more than the remnants of the Republicans will, but they will gain steam as the Republicans start to see the Democrats as a true centrist party where their voices can be heard. In the end, we will be back to a fully functional Two-Party System, but this time, the Democrats will wind up on the center to center-right end and the new party, let's call them Labor just for kicks, will end up on the center-left to left end of the spectrum. And through this process, the system will self correct and the political spectrum will shift back to it's traditional orientation. We will again have two viable and truly representative political parties in this country, who are not so ideological that things cannot get accomplished. Once this happens, the United States will return to it's moderate roots, and gears of good government will begin to freely turn, instead of grind in place.